The United States Congress designated the Dark Canyon Wilderness (map) in 1984 and it now has a total of 46,360 acres. All of this wilderness is located in Utah and is managed by the Forest Service. With narrow, steep walls that block the light in the morning and late afternoon, Dark Canyon Wilderness is aptly named. Once home to a small segment of the widespread Anasazi Indians (Ancestral Puebloan), the canyons included in the area (Dark and Woodenshoe Canyons, and their tributaries) make up the roughly horseshoe-shaped Dark Canyon Wilderness. This is an extraordinarily beautiful and remote section of the Colorado Plateau where sculpted and colored walls of Cedar Mesa sandstone rise above the canyon floors. You may see evidence of the Ancestral Puebloan culture in the form of structures, rock art, or artifacts. Remember, it is against the law to remove or disturb any archaeological resources you may encounter. Please leave things as you have found them for future study and so those that come after you may experience this unique resource as well. 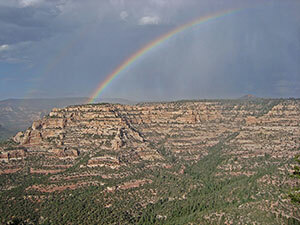 The Dark Canyon Wilderness is located in southeast Utah near the town of Blanding. To reach the ten different trailheads that provide access to the Wilderness, visitors must ascend roads to the top of the Elk Ridge Highlands which may be snowdrifted into early summer in heavy snow years. From these trailheads, you descend into the canyons that comprise the Dark Canyon Wilderness. The Utah Wilderness Act of 1984 created Dark Canyon Wilderness, representing the first major Colorado Plateau Canyon terrain to be protected in the National Wilderness Preservation System. This diverse canyon country contains arches, old-growth Ponderosa Pine stands, meadows, springs, seeps and hanging gardens. Due to years of drought, some seeps and springs have disappeared making water very scarce. Plan to carry all the water you may need with you and/or contact those with local knowledge for the location of the very few water sources. Check the Dark Canyon Wilderness Blog at wilderness.net for updates on water and trail conditions. Life zones range from ponderosa pine and aspen-covered high country to more arid desert vegetation in the bottom of Dark Canyon at the Wilderness boundary. High red rock canyons dwarf visitors with terraced castle-like walls towering 3,000 feet above the canyon floors. Wildlife species are diverse and include mule deer, elk, turkey, some cougar, black bear, and bighorn sheep. All the trails dropping into the canyons are moderate, but they are often difficult, if not impossible, to find and follow. Be sure to carry a good, detailed map and a compass. Once you're on the floor of Dark Canyon itself, however, you'll have no trouble following Dark Canyon due to the canyon walls, through the length of the canyon. At the junction of Dark Canyon and Woodenshoe Canyon, you may ascend the Woodenshoe trail out of the Dark Canyon Wilderness or continue past the western Wilderness boundary into the BLM-managed Dark Canyon Primitive Area and on down to the Colorado River or upper end of Lake Powell when the reservoir is full. Planning to Visit the Dark Canyon Wilderness? How to follow the seven standard Leave No Trace principles differs in different parts of the country (desert vs. Rocky Mountains). Click on any of the principles listed below to learn more about how they apply in the Dark Canyon Wilderness.